When we got our first Vizsla, we felt there was something special going on. This breed is a very special one by its characteristics and has a way of making you feel permanently attached to them; because of this we felt Örökké was right. 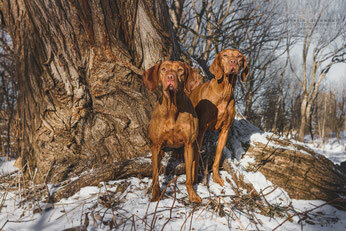 We are a small Vizsla breeder located in the Montreal area that, for now, produce litters only occasionally. 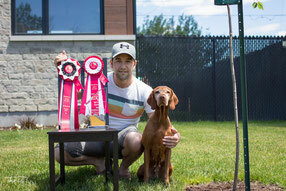 Our main goal is to maintain the quality of the breed by adhering to the CKC and Vizsla Canada’s Breeding Guidelines. Our kennel and our dogs are registered with the Canadian Kennel Club (CKC), we are also member of Vizsla Canada and Vizsla Society of Ontario. For more information, please make your way through the many different sections of our website and if any questions remain, feel free to contact us. Thank you for your interest in Örökké Vizslas.